Finding the right political candidate whom you can truly support is a lot like dating, if you think about it. Like dating, it’s so hard to find that special someone with whom you can really build a relationship. Also like dating, you likely don’t have all the time in the world to invest to get to know someone. That’s where Voter comes into the picture. Boasting an online-dating engine and user interface, Voter is an app that matches up citizens who want to take part in the political process with their dream candidate. Best of all, it allows them to do it from the handheld comfort of their mobile phone or tablet. One of the biggest criticisms that politics faces today is that people don’t have sufficient time to weed through all of the information that the media throws in their faces about candidates. 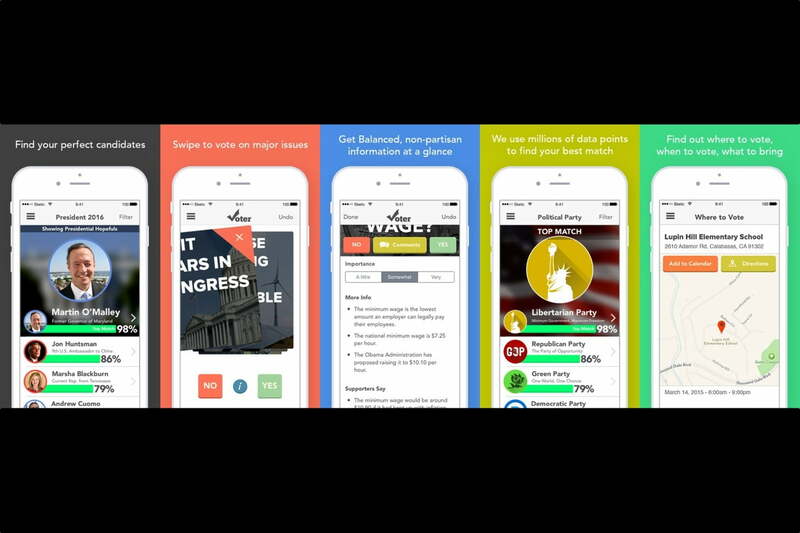 The app aims to streamline the voter-education process by giving users easy access to a candidate’s positions, through his or her political history. This includes a quick summary of his or her voting record, public speeches, finances, and contributions. Voter makes the user experience intuitive and enjoyable. Curious voters can simply swipe left or right on their screens to register agreement or disagreement with current, political issues. Then, they’re matched with the candidate who best lines up with their choices. Presto – they’ve found their dream candidate, just like that. More than just a superficial match, though, the app provides more interested users with the option to get to know their new matched candidate on a deeper level. Users can access accessing detailed, biographical information as well as infographics that display specific campaign donations from corporations and industries. Feeling like you want to take your relationship with your candidate to the next level? No problem. Voter offers you direct access to make political donations to your candidate of choice and communicate with his campaign. Excited political watchers can download the iOS version from the App Store right now, while an Android version is still in development. Plans are to expand Voter’s functionality to local elections, too, but it’s currently limited to the 2016 presidential candidates.